First of all, if you complety new to forex and MT4 please check the basics! Basic of the “Forex Neuro Trader MACD and RSX” is the MACD and RSX as we know it. 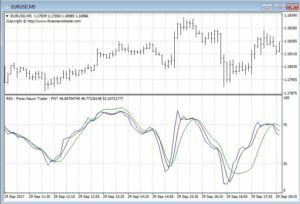 Then we use about 20.000 bars of M5 data from EUR/USD and some other inputs (e.g. OHLC, RSI, MA, etc…) and let the neural network find the optimal output for the new indicator “Neuro MACD” and Neuro RSX”. to minimize the risk of “curve-fitting”! You can combine the Neuro MACD / Neuro RSX with other indicators like, time, support and resistance, RSI, and others. This indicator is for trader, the indicator just show you the MACD / RSX with the advantage of some bars ahead. 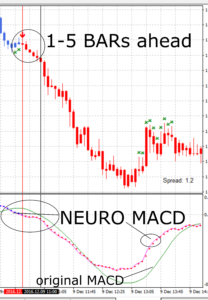 Here you see the Forex Neuro Trader MACD with a prediction possibility of one to five bar in advance! It is able to be faster for one and up to five bars! but working best on M5. Arrows (red – SELL // blue – BUY) are possible entries and the green “x” are possible exits. Just give it a try for free!! Don’t forget to update the Neuro MACD from time to time! We use about 20.000 EUR/USD, 5 minutes bars for input/training and about 4.000 bars for testing out-of-sample, so this is proportion of 80:20. 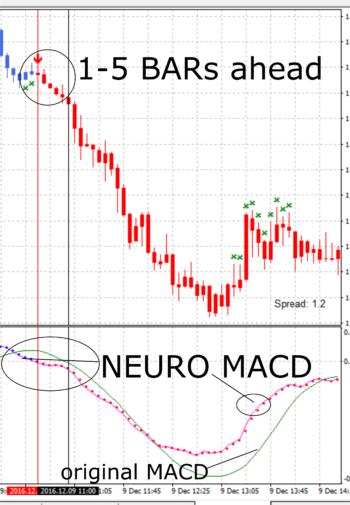 (training vs. out-of-sample) You see the Neuro MACD (prediction) vs. MACD (actual) – the Neuro MACD has a R² of 0,98. 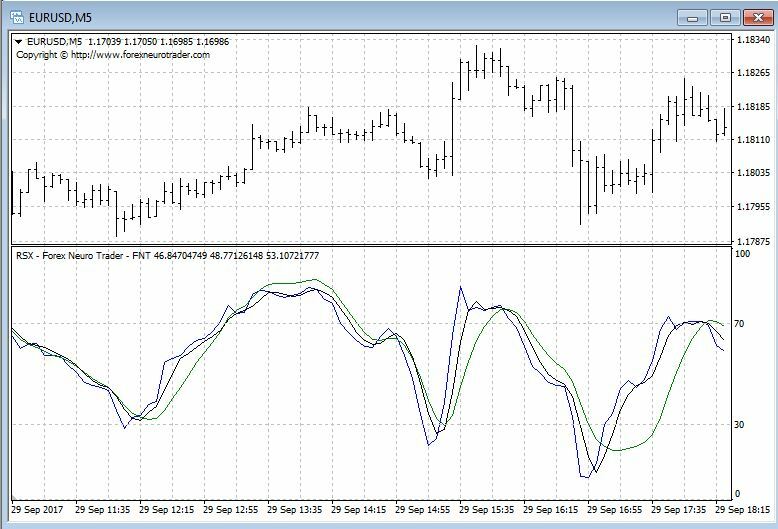 After training, test and good OOS (out-of-sample) results we use the formula and implement it to MT4. It’s possible to add a soomthing of 2-5 MA, but be aware that this is also a delay for the signal.